Around the time when people all over the world were getting ready for the 'end of the world', Rubel and I celebrated the 21st of December in one of Manila's prestigious hotels. He happened to book a Bayview Room for our late anniversary getaway, which made me feel mixed emotions --- like what if the world really ended that day? It would be a quick one for us since we were by the bay. A Tsunami could easily wash us over! But thankfully, our staycation in the metro went on smoothly. 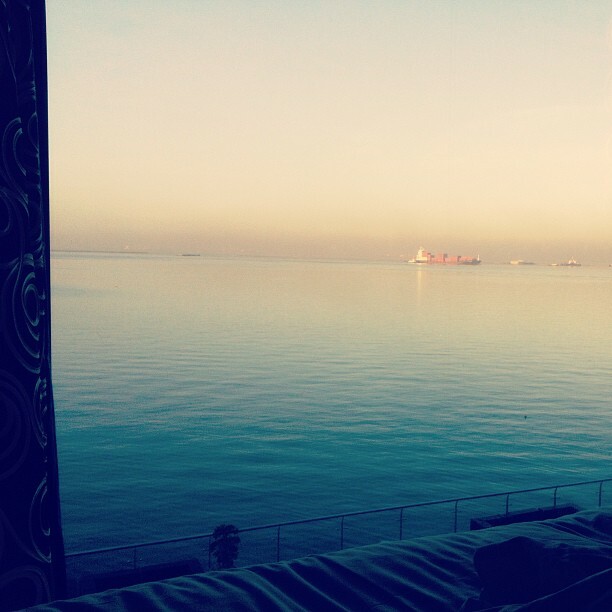 When we woke up the next day, Manila greeted us with a warm and sunny 'hello'. It was a new beginning. It was a new day that we were so grateful to have. Looking back, I realized that this year has been very challenging yet fruitful in a sense. 2012 must have given me the most trips in a 12-month span. 2012 would have to be one of the best years for me, as Rubel and I celebrated his 30th year in two of the most gorgeous places in the Philippines --- Bohol and Coron. We welcomed this brand new year by the beach, while watching the sun rise and set everyday. This year left me to experience one of the scariest boat rides in my life, while island hopping with my family in Laiya, Batangas. Waves as high as 2-3 feet carried our banca constantly. No one told us that it wasn't safe to leave the shore since a storm was about to brew. Thankfully, we survived the 30-minute ordeal considering that we had small kids and an infant in-tow. This year has helped expand my social network. 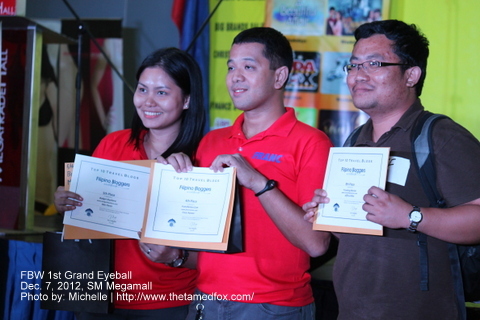 As I was recognized as a Travel Blogger at one of Meet Manila's first events. Other than that, I was also awarded as one of the Top 10 Travel Bloggers of Filipino Bloggers Worldwide later this year. This would have to be one of the most exciting ones since I was able to meet fellow PTB members in person: Franc Ramon and Jeffrey Rilles. And of course, who doesn't want to get featured in a Travel Mag every now and then, right? 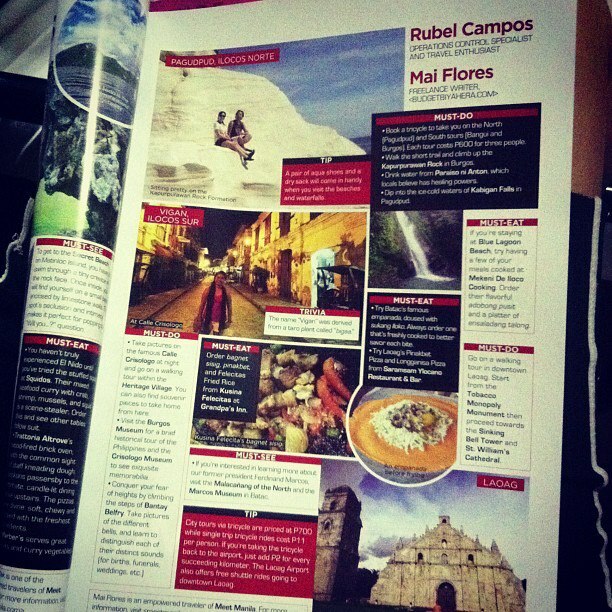 Being published on TRAVEL Magazine on their September issue would have to be one of my 2012 highlights! This year, I met one of the most humblest people in the Philippines --- Edmar Guquib #TownExplorer. Meeting him in person during my Vigan trip would have to be ecstatic on my end. My passion for traveling ignited even more when we started exchanging stories of our individual journeys --- individual yet on very common grounds. I gained a really good friend out of that PTB meet-up. I probably gained a lot of weight during my recent trip to Ho Chi Minh City. 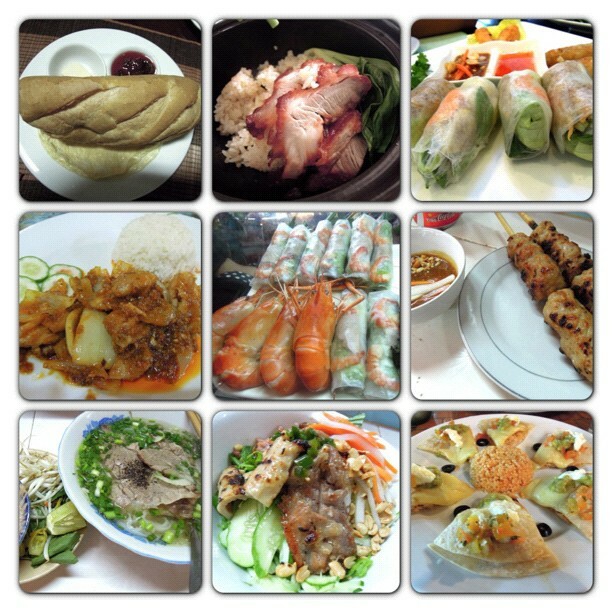 Rubel and I probably spent most of our days going around the city, and scouting for the best Vietnamese food in town. Given that, Vietnam would have to be the first on my list when it comes to superbly cooked and seasoned Asian food --- oh, and cheap beer too! Saigon beer (the red one) would have to be the best-tasting yet! There's no place like Manila! I haven't felt nostalgic in years. Not since I visited the National Museum last October. I never thought I could take a photo with the the famous Spolarium Painting of Juan Luna as my background. Let alone explore the whole of the museum without spending a single penny! Yes, admission was free back then since the historical establishment was celebrating its Museums & Galleries Month. Nothing beats being in Manila for that! This post is my entry to the Pinoy Travel Bloggers' Blog Carnival for December 2012 with the theme "2012: This Year In Travel". Gay Mitra - Emami and Regine Camille Garcia hosts this edition of the blog carnival. I don't know if I can make mine. I'm so lazy to write now. Hehe. looks like you really had that big year! being on the top 10 list and articles published! yihaa! congratulations! cheers to more fun trips and new achievements this year! Thanks for the tag Mai:) en nice meeting u also :) Happy New Year! More Travels, More Happiness! I agree that traveling is also about connecting and making bonds. :) Cheers to a more amazing 2013! Great year!!! .. and may God bless you with so much more this year! Happy New Year!! Congrats, you deserve to be awarded. Your hard work and perseverance took your forward. Keep it up! Indeed, the Philippines holds a lot of wonders. We just need to devote our time to discover them! Happy New Year! What a year!!! I'm glad I was a part of it. It was nice to meet you in person. 2013 would be a better your for both of us. Happy New Year! Good luck for this year! Hope you had a prosperous one! Nice travel adventure. More travel for you this 2013! Happy new year.! I promise to continue with the travel adventures that are being given to me thanks to friends and acquaintances that led me to these opportunities. I have very few travels to look back at but hoping it will a lot more in 2013 and beyond. Happy to visit first the Philippines before exploring other countries. We need all the tourism push we can get so that our country can become progressive and competitive. 2012 was a great year for Mai, hats off ako sa accomplishments mo. Lucky me to see you in person. Hope 2013 brings more travel opportunities for you. Syempre, kasama tsibug doon. And I pray that God will always there to give you protections from harm. Lucky you to meet Edmar. I am one of his fan too. Anyway, congrats on all your achievements and happy and contented love life. Congratz for such a wonderful travel experience in 2012. You're so blessed to enjoy such wholesome activity. And you're more blessed that the end of the world had not come, or else you're out of town and you're away from your family. Anyway, the best thing for everyone to do is to prepare spiritually. Anyway that's life. Happy new year! you're right, but in my case, nothing beats Bacolod :))) when I read travel adventure stories like yours, it makes me wish that I could have been as adventurous in travel when I was younger. Stay safe and travel happy! A blessed 2013! I have a similar photo with the Spoliarium during one of John Silva's walking tour at the National Museum. I must say I started appreciating museum trips after that. I love Bohol and Batangas as they are diving havens but I've never been to Coron. My family went to Iloilo for the first time this year and hopefully Davao next year. There's still no place like our hometown right? but gee, I want to become a traveler like you.. going on those beautiful places and eating foods of the natives there.. that's like a dream to me. I enjoyed reading your post and congratulations! you're one of the top travel bloggers now. wow, just wow.. The only place I've been to are the places that are near here in Bataan, like Corregidor, Mt. Samat, Mt. Tarak. Anyway, have you been here in Bataan? It's also a great place to visit and I recommend visiting us here. 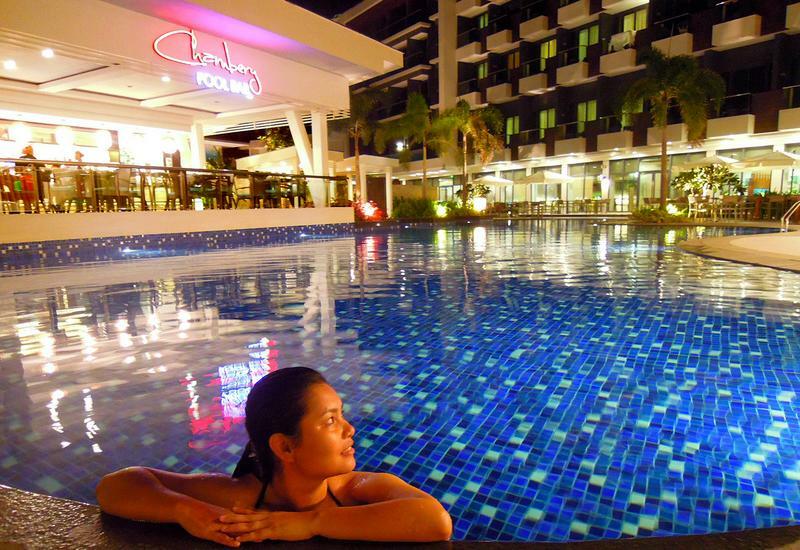 You can find the Fav Hotel a great place for accommodation too. You can make a quick visit at their site if your interested for reservations just in case. Well, thanks again for a great post there! Yep, you're right! Happy New Year too! I'm sure it will be! 2012 was a lot of fun because I finally met the person behind francramon.com! Ang cheesy lang noh? hehehe! I couldn't agree more. Here's to more travels this year, Ross! Of course, I won't! I even got copies..lol!